There is no relationship like the one between an owner and a pet. Each pairing is unique and has its own set of quirks and idiosyncrasies. However, there exists no bond stronger than the one between an animal and the owner when they have saved one another. That is the essence of the connection between Lily and Keisha. Lily, trying to make her way post-college and post-boyfriend, faces the heart-pounding fear and helplessness of a young woman who narrowly escapes a home invasion. On the heels of her ordeal, her snap decision to become the owner of a tiny and rambunctious ball of fur leads Lily on an string of adventures that change the course of both of their lives. 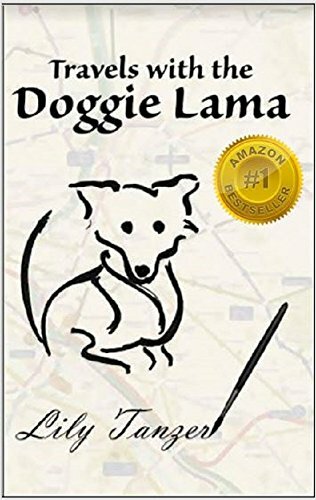 Lily Tanzer, author of Travels with the Doggie Lama, has shared her most intimate experiences with readers. These intimacies aren’t the normal ones; they revolve around the amazing connection she found with her puppy, Keisha. Their relationship goes far beyond a doting owner and a loving pup. Lily and Keisha are connected on a spiritual level, and it becomes increasingly clear throughout the book that Keisha is as much a soulmate to Lily as any human. The author lays out, in no uncertain terms, the trials and tribulations of being a first-time dog owner. Her descriptions of the utter devastation caused by such a tiny force of a nature within the confines of a small apartment will hit home with every dog owner. Her doubts and financial fears resonate with any reader who has struggled to make ends meet while feeling the overwhelming desire to put the needs of one’s pet before his or her own. Tanzer delicately addresses the relationship she has with her parents–another relatable element of her story. Readers are privy to Lily’s most embarrassing money struggles and her resignation when her father steps in to save the day. College graduates struggling to make their way and find ways to hide those battles from their parents will appreciate the author’s descriptions of her humiliation upon hearing from her banker father. As a lifelong pet owner, I appreciate the way Tanzer traces the relationship between Lily and Keisha over the years and Keisha’s various reactions to the people in her life. It doesn’t take too long to begin picturing Keisha as more of a spirit than a dog. Her vibrancy and her complete dedication to Lily as she moves their two-person family across the country jumps off the page. When Lily’s life takes a turn and she finds love at last, Keisha is right there beside her to show her approval of the expanding family. And when Lily’s long-awaited pregnancy occurs, Lily’s concerns about coping with jealousy overwhelm her. There isn’t a pet owner-turned-new parent out there who won’t relate to the ride Lily takes on that emotional roller-coaster. Tanzer’s book is well-written, easily relatable, and manages to show pet owners yet another facet of the owner-pet dynamic–one that extends beyond the closeness we all recognize and borders on the spiritual. Posted on June 28, 2018, in Book Reviews, Five Stars and tagged biography, death, family, fantasy, fiction, life, lily tanger, memoir, nonfiction, parents, pet, relationship, romance, teen, Travels with the Doggie Lama, YA, young adult. Bookmark the permalink. Leave a comment.